One of my shooting/hunting/reloading buddies bought a Tikka T3 in 22-250 with an 8 twist barrel. He's running 75 grain Amax's out of it at around 3k FPS. So far he has killed 4 Texas whitetails that were relatively smallish (125 lbs live weight ) and none of them has taken a step after impact. This was at ranges of around 150 yards. He's also killed four Auodad sheep with the same set up. 3 were 200 lbs or so and also at 150-175 yards. The fourth was a big son of a gun, 350 lbs at about 425 yards. That one made it 20 feet. He's never recovered a bullet, all have exited. Personally I wouldn't shoot target bullets at game animals. I'll stick with Ballistic Tips and Accubonds for filling tags. Your mind is your primary weapon,never let it get rusty. Years ago I used 208 A-max bullets in my 30-378 at the time Hornady listed them for deer size game. Well I learned that they may kill deer but they also destroy them as well. This was just over 100 yards. They do work good in my 308 Win on deer just not anything faster. Berger 230gr target hybrid is all I use in my 30-378 now and they work well , no excessive damage. Here’s the ELD X and M side by side. Muzzle velocity was 2753 for the X and 2775 for the M.
I don’t think any of us could ever see the difference on game. "Years ago I used 208 A-max bullets in my 30-378 at the time Hornady listed them for deer size game. Well I learned that they may kill deer but they also destroy them as well. This was just over 100 yards." Yup. About what I'd expect. Ya got him though! Oh yeah, I was thinking the same thing. Been shooting a few of the 200 ELD X’s from my 300 and I have a sneaking suspicion they might not be the best pick for it at 3100. I’ve got some 230 Berger’s as well. If I get around to shooting them I’d love to stuff one into the jugs just to see what happens. They are some long devils. Accubonds and Barnes TTSX/LRX cover my every need for big game hunting. Weatherby...There is no replacement for displacement! I've seen _many_ pics and reports of Lapua's Scenar bullets on deer and a bunch of other game, mostly from a person I trust. I have zero issue putting a Scenar (or ScenarL) on game. 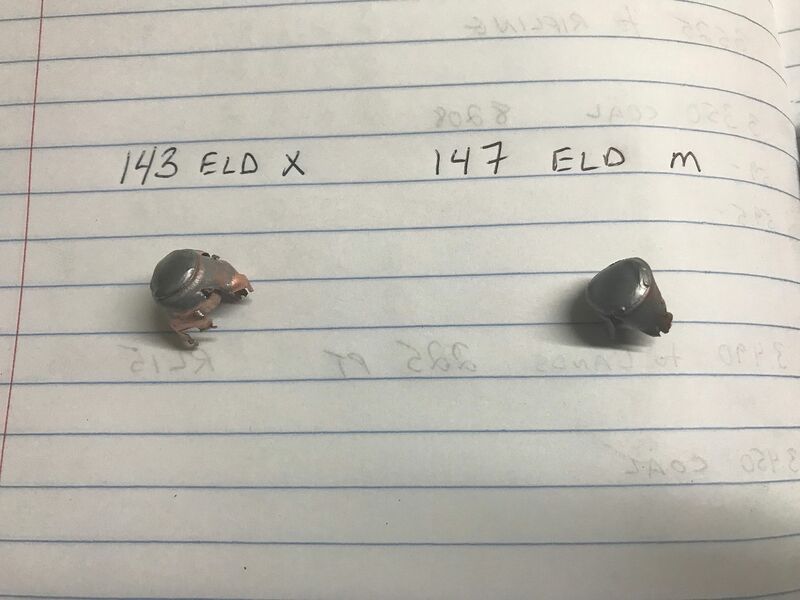 We’ve shot deer, elk, and antelope with several different “match” bullets over the past 5 or 6 years.... including: 123 Amax, 123 Scenar, 130 VLD, 139 Scenar, 140 Amax, and 147 ELD out of the .260/Creed/PRC.... 162 Amax and 168 VLD out of a 7mm Rem Mag.... and the 105 Horn HPBT, 105 Amax out of the .243. So, I’ve got a fair sample size. During that same time, we’ve also killed with the 130 Accubond (6.5mm), the 160 Accubond (7mm), 127 LRX (6.5mm), 140 TTSX (7mm), 143 ELD-X (6.5mm) and 90 Sierra GameChanger (6mm). The Accubonds all exited, and game was recovered fairly quickly.... but they are tougher to make hits with than their slicker “match” counterparts. The ELD-X and the Sierra GC seem to be an excellent compromise of match-type accuracy, high BC, and on-game performance. I presume Nosler’s ABLR is similar... but I’ve never been able to get them to shoot worth a crap in any caliber/chambering. Out of all of them, I think the Scenar acts most like a “game” bullet, and is by far the most consistent performer. If you stay heavy-for-caliber, and keep the impact velocities down between 2800-2000 FPS, the plastic tipped “match” bullets seem to act just like any other “cup & core” bullets. The VLDs have performed well, but they seem a little erratic to me. I’ve gone back and forth on the Amax/ELD.... but wouldn’t hesitate to shoot a deer or Pronghorn with one... I remain a bit dubious about their use on Elk. I will say, I’ve yet to find a Partition, Accubond, SST, etc.... that can hang with the “match” bullets in regard to true accuracy in the field. The fact is, they’re easier to make hits with when the ranges get beyond about 250 yards. Those “minor” differences you see on paper, show up in spades in the field. I know that’s hard for guys back East to believe.... but I’ve seen it manifested again and again when the wind is blowing, the heart is pounding, and there’s fur (or $$$) on the line. My dad just crushed another huge cow with his 6.5 Creedmoor and 147 ELD-M's yesterday. 250yd and it collapsed at the shot. We shot 3 elk and I don't usually gut them so I didn't do a autopsy. My buddy and I both shot cows with our 300wm's and 215 Bergers. Mine was 1081yds and his was 250yds. Mine collapsed and his ran 40yds and fell over. Over the last 8 years I've shot 15 elk, 2 moose, 3 antelope, and 3 deer with vld type bullets. My biggest bull went 60yds before he piled up but that is the longest distance traveled by any of the animals I've shot and further than any my wife, my dad, or my buddy have shot in the vitals. My dad shot one across the bottom of the belly/chest that was quartering away. It went 150yds or so before I caught it and finished it. My buddy has shot 8 elk, 1 antelope, and 1 deer with Berger 215's in the last 4 years. My wife has shot 2 elk and a moose with 140 Bergers out of a 6.5x47L in the last 4 years. My dad has shot 5 elk, a moose, and 2 antelope in the last 4 years. 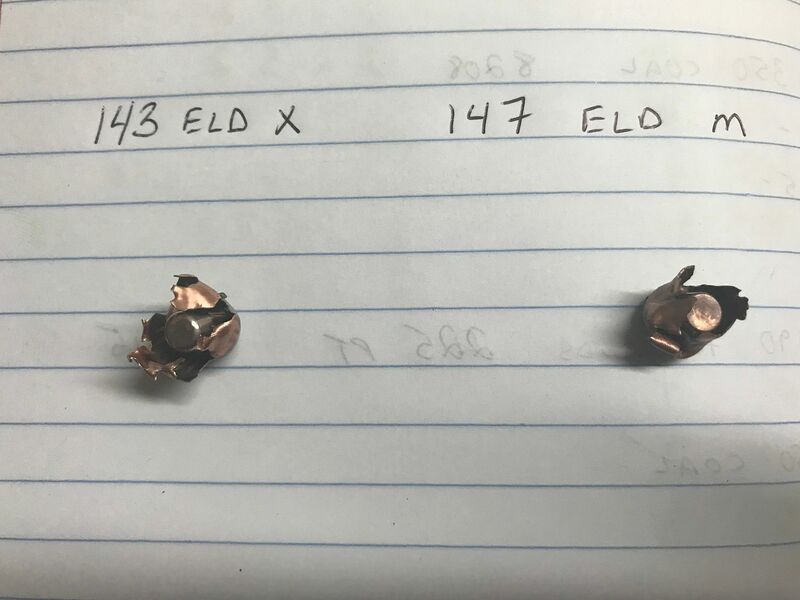 Most were shot with 147 ELD-M's out of a 6.5 Creedmoor but some were 162 Amax's from a 7-300wm. I've used 140 Amax's from a 6.5-300wm, 162 Amax's from a 7-300wm, 210 Matrix from a 30-8mm mag, and 215 Berger's from a 300wm. That is 44 animals and the furthest of those shot in the vitals went 60yds. That is a lot of proof VLD type bullets work, and work well. BTW very few of those elk shot had exit wounds. I was very worried about that when I started shooting VLD type bullet and I was always of the mindset that bullets needed to exit so you had 2 holes to leak blood. I could care less about having 2 holes now with the performance I get with VLD's. They devastate vital organs when they get inside.